Is there a stairway to heaven? Yes, there is! 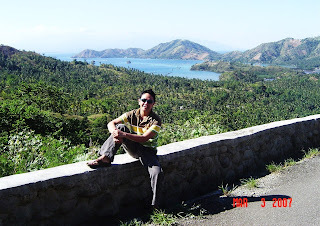 I grew up in small town of Cateel, an easternmost part of Davao Oriental. It is a coastal town lying at the very mouth of the Pacific Ocean. Just imagine the Pacific Ocean and its wonders. Nevertheless, Cateel does not only boast its waves and its seas. Cateel is blessed with various spectacles of the nature that until now I always yearn to glimpse and untiringly experience over and over again. Name it, we have Langyawan Cave, the Suso Ng Daga Mountain, Mainit Hotspring, the Cateel River, and the Philippines highest waterfalls – the Aliwagwag Falls. The exotic beauty of the Aliwagwag Falls is indeed the pride of every Cateeleno like me. Not just because it is the highest waterfalls in the country but because of its magnificence, majesty, splendor and above all, its grandeur. Just imagine, 84 series of wonderful falls leading you to the main stream. Isn’t it breathtaking? The trek of reaching up to the top starting from the first Series of Falls, experts say it will take you around 2 days to actually get there. The rapids are just awesome! Rock formations are astonishing. The whole place is surrounded by endagered flowers. Aliwagwag Falls is also the home of an infamous fish townfolks considered as town’s pride and favorite. We call it Sawugnun. I have tasted it myself. It is bitterly tasty. Best serve as paksiw. Old folks say this fish can only be found in waters of Aliwagwag. In addition to its grandeur, Alwagwag Falls serves also as one of the main sources of the clean and green Cateel River that was awarded as the cleanest river in Region XI. SO, EXPERIENCE THIS EXCITEMENT AND ADVENTURE... Visit the Aliwagwag Falls, the highest waterfalls in the country. How to get there? From Davao City, you'll take a ride on van or bus going to Cateel Davao Oriental via Compostela Valley. The Aliwagwag Falls is located at Barangay Aliwagwag. And the Falls itself is just conveniently situated along the highway. Taking few steps across the bridge, you'll see its brilliance and magnificent view. And when you get there, don’t miss to experience your first step to the Stairways to Heaven called the Aliwagwag Falls. 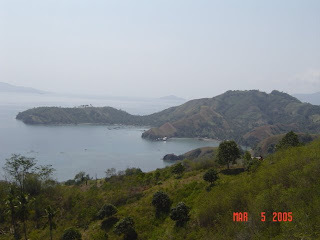 This is the Sleeping Dinosaur of Mati, Davao Oriental. This is the Sleeping Dragon of Sta. Maria, Davao Del Sur. What do they have in common? They both are said to be "sleeping" - waiting to be awaken! 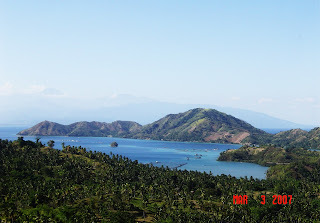 Explore these places - Mati and Sta. Maria, - there's more to see and more to experience. AHA! SINO ANG NAKAYAPAK THE WHOLE BEACH TRIP? OLAN? PHILLIP? GARY? JONG? WENDEL? ANNA? Sukat na lang natin... dali... one... two... three... PAK! Reason: naka high-heels kasi lola nyo sa buhanginan!!!!! 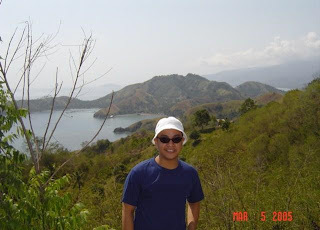 I have been to the different beaches in the Islands of Samal. I guess I've been to the 80% of the beach resorts there. Sometimes, there is no excitement in my part of going there often. Solution: find other BEACH SPOT! Googling, I've found Gumasa Beach located at Glan, Sarangani Province. 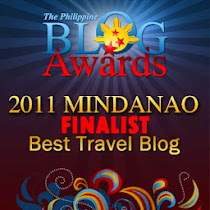 One blog describes it as the Boracay of the Province. The other site describes it as an undiscovered Paradise. Instantly, the calling of the beach water slowly enticed me. One soft voice whispered: go to that beach, go to that beach. My best buddy Phillip told me that it's kinda far. Unsafe to travel. But again, the calling of the beach was there. Fortunately, my very good friend Anna Mae was here in Davao and stayed in my house for a week. Luckily, I was able to convince her and Wendel for Gumasa Beach Adventure. We were able also to tag Gary and Jong to come with us. And Phillip too decided to join us for this Beach trip. Anna, Wendel, Phillip and I went Gaisano South to buy things we needed for our trip. Gary and Jong followed later. Phillip cooked for us his delectable paksiw and tinolang isda for our very late dinner. He also cooked adobong baboy for Saturday's trip. We were able to have our dinner at 11:00. Kinain na din namin ang adobong baboy. Hehehe. Sobrang sarap kasi. We woke up early to prepare for the day's trip. I was the last one to get off from bed. Had our breakfast and headed to meet up Gary and Jong. Car ni Gary gamit namin. We left Davao at around 8:00. The trip was fun. Puro kuwentuhan. Tawanan. Hiyawan. When we got to General Santos City, Phillip, Wendel and I went off the market to buy fish and some pork. Gensan boasts as the Tuna Capital of the Philippines. But pag dating namin sa palengke ng Lagao, wala kaming makitang tuna. Ironic, right? Hehehe. So, bili na lang kami gulay at karne. Hours later, dumating kami at last sa Glan, Sarangani. We headed right away sa palengke. Luckily, naabutan pa namin dun all the fresh fish they had for the day. We were thinking mura. Same lang pala ng price sa Davao. Finally, nasa Gumasa Beach na kami. We stayed at BROD LOUIE WHITE SAND BEACH RESORT AND SPA. But before we decided to stay there, we went to the other Cove to check other resorts. There were about 4 resorts there. Crowded at that time. Back at Brod Louie. We checked in. Got the Rest House - kitchen on the first floor and two rooms on the second floor. Just perfect for the 6 of us. Had lunch with Philip's cooked adobo. Later, prepared ourselves for "walang katapusang picturan". ETO NA... WALANG KATAPUSANG PICTURAN AT KODAKAN. From one edge of the cove to the other. Ibat ibang pose. Nakatayo, nakaupo, nakaluhod, lundag, lahat, kulang na lang tumuwad. Hahaha. Ang pinakachallenging, yung palundag lundag. Ingat na ingat ang lahat. Paano kasi, laki ng mga tiyan ng mga tyan. Dyesebel kumbaga. Dyes kilos ang belbel. Eto. Si Wendel, emote ng emote sa kapopose. Siya kasi ang Jake Cuenca ng grupo. So dapat, perfect ang angle ni Palos. Si Anna, perteng hiyak sa iyang tiyan. Dapat ang side view lang ang angle. Payat kasi tingnan. Hahaha. Dili sya palupig sa iya Auntie Anne Curtis. Si Gary, katawan sa katawan ang labanan. Mossimo Body ito. Body shot pictorials ang drama. Rampage Reloaded. Si Jong, the vain one. Bahala nag muitum, picture picture pa rin. Punchline: gluta lang ang katapat. Emotera din yan sa picturan. Si Phillip naman. Maintain lang sa kakatango sa camera sabay smile kagad. Sabi nya yun ang proper way to smile. Tumango muna sa camera then smile. In other words, he has perfected the art of smiling. Hahahaha. Eh AKO.... Hahahaha. Natatawa ako habang nagsusulat ngayon. Paano kasi. Di ko matantiya paano magperfect smile. Hahaha. Sinubukan kong lumundag. Hayun, gawas tanang belbel. Hahaha. Sabi ko na lang. Di ako hiyang sa palundag-lundag. Hahahaha. OH, before I forget, we had fun over kayaking. And guess what??? We all got it for free!!!!! Ang bait ni Ate Clareth, caretaker ng Resort. Phillip started cooking for our dinner. After almost two hours, the food was ready. We feasted on the mouthwatering Pork & Best Barbeque, Inihaw Na Isda Sa Bato, Kinilaw ni Wendel and Phillip's infamous Law-oy. Dinner was set outside the rest house near the Resort's Bar. When we were about to take our dinner, a sudden change of weather happened. Something we didn't expect to happen. Yun bang nasa kalagitnaan ka ng kasiyahan biglang nagulantang ka na lang dahil sa malakas na bagyo. Literally, yun ang nangyari. We were having our dinner when it happened. Super lakas ng hangin. Hindi namin alam kung hangin habagat or what. Ang alam lang namin was it was really terrifying. We can even hear the scary sound of the strong wind. Pati yung puno ng niyog sumayaw sa hampas ng hangin. Maya maya. Dumilim ang buong paligid. PAK!!!!!!! Black-out ang buong Sarangani.Total black out. No electricity. No water. We didn't have the choice but to wait. One hour. Two hours. Three hours. Pumayapa na ang paligid. Tapos na ang bagyo. But still no electricity. Maya-maya, lahat ng naka check-in sa resort nagsipag-alisan. Literally, kami na lang ang naiwan. WAAAAHHHHHHHHHH...... Ano gagawin namin the whole night walang ilaw? Solution: ALAK!!!! So, the night ended with no water, no electricity.But with Tanduay, Iced Tea, Ice and Yosi. The great part of that night was a great debate about Political Will. Plus ang concept ko about KAMATIS AND TINOLA.... Hahahaha. I'll never forget it talaga. Hahahaha. Gising na ang lahat when i woke up. Breakfast was great courtesy again of Phillip, the self confessed kitchen-animal. 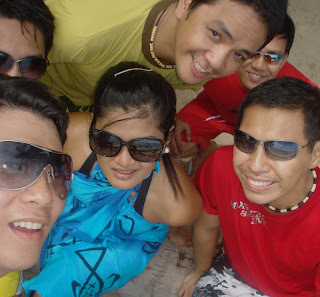 When we went out of our rest house, wala ibang tao kundi kami lang. Meaning, we exclusively owned kuno the whole place. 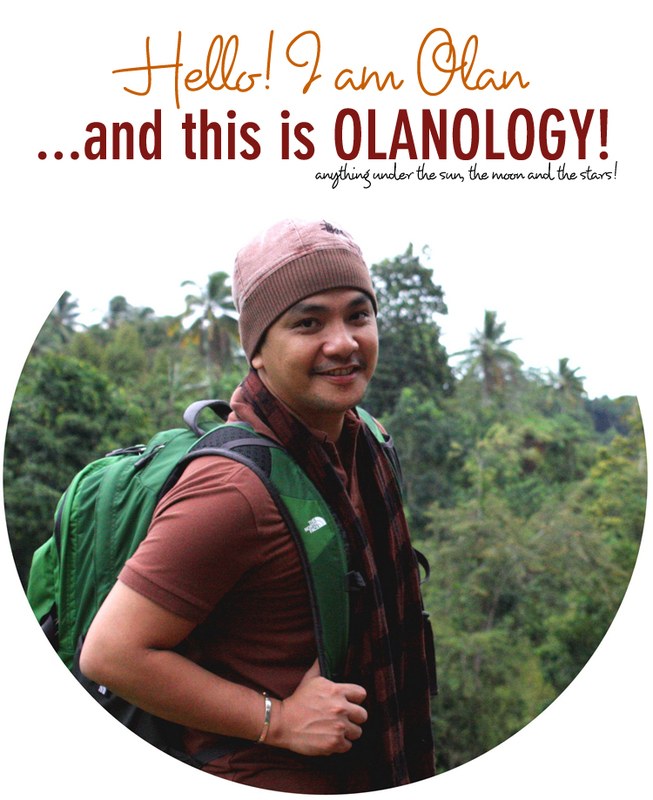 So,we were all back to picturan (hinding hindi mawawala - dahil kay friendster again! ), chikahan, beaching lounging, swimming, snorkel and kayaking. Maya maya, si Anna, exotic beauty na sa sobrang tan. Kung may foreigner lang, panalo na sya! After the fun-filled & pressure-free beach escape, it was time to go back to our real world. Back to the city.We passed by CLIFFHANGER for a quick view of the whole Davao Del Sur. Inside the car, tuloy parin ang halakhalakan, tawanan, kuwentuhan at pabilisan ng pag-ubos ng junk foods. When we got home kinabukasan, nabalitaan na lang naming there were 22,000 casualties sa Cyclone na tumama sa Myanmar. Yung malakas na hanging habagat nung night na nasa Gumasa kami, malamang naligaw din yun dun. Good thing, everyone is well. GUMASA BEACH RESORT... an escape from the busy city. Going there with great friends was a sure fun and tremedously awesome! PHILLIP, ANNA, WENDEL, GARY & JONG - beach outing na naman tayo ulit.